Different Types of Alcoholics: How Many Are There? In this article, we will provide some of the historical attempts to categorize different types of alcoholics, and explain the five different types of alcoholics as they are currently understood. This article provides a short overview of a very complex topic. So if you are looking for additional information about alcoholism, how to identify it, and how it can be treated, we urge you or your loved one to call our 24-hour hotline at (888)-459-5511 to speak with a knowledgeable representative who can offer more personalized information. What Are The 5 Types Of Alcoholics? Is There Such A Thing As An Alcoholic Personality Type? Alcoholism has probably existed as long as humans have known how to distill alcohol, so there is a long history of alcohol use and abuse throughout all of recorded history. Excessive use of alcohol was known to be the cause of personal and social problems in Biblical, Egyptian, Greek, and Roman times, and has been studied and researched as a problem ever since. Problem drinkers – those who often drink to the point of intoxication, and the resulting impairment of faculties and decision-making. Binge drinkers – those who drink excessively large quantities of alcohol frequently. Alcohol abusers – those who drink regularly, with a consistent increase in the quantity consumed and the frequency of consumption. Alcoholics – those who have developed a physical and psychological dependence on alcohol. Type 1 Alcoholic – not as influenced by genetics as Type 2; onset tends to occur in adulthood as the result of setbacks, losses, and outside circumstances; personality traits include anxiety, shyness, rigidity, pessimism; dependence level involves drinking to reduce one’s anxiety level. Type 2 Alcoholic – much more influenced by genetics than Type 1; onset tends to occur before the age of 25, and they drink regardless of outside circumstances; personality traits include impulsiveness, risk-taking, being quick-tempered, optimistic, and excitable; dependence level is high and often involves other drugs. The problem with this analysis was that Cloninger’s two subtypes were based on a study of 360 male patients being treated for alcoholism in Veteran’s Administration hospitals. Thus the data was thus not a representative sample of men and women, and it also ignored the 25% of alcoholics who never seek or receive treatment. So in 2007 a more thorough study, one based on a more representative sample of people with AUD, was undertaken by the National Institute on Alcohol Abuse and Alcoholism (NIAAA), a unit of the National Institutes of Health (NIH). The NIAAA study was based on the National Epidemiologic Survey on Alcohol and Related Conditions (NESARC), a nationally representative study of alcohol, drug, and mental disorders in the United States. It focused on 1,484 NESARC respondents who met all diagnostic criteria for alcohol dependence and included people who were in treatment for their AUD as well as people who were not. Young Adult Alcoholic – constituting 31.5% percent of US alcoholics, this subtype of young adult drinkers is characterized by low rates of both family alcoholism and co-occurring substance abuse and mental disorders. This subtype rarely seeks or receives help to treat their alcoholism. Young Antisocial Alcoholic – constituting 21% percent of US alcoholics this subtype tends to be in their mid-twenties, and is characterized by an early onset of regular drinking and alcohol problems. Over 50% of the members of this subtype come from alcoholic families, and have been diagnosed as having an antisocial personality disorder. Over 75% smoke both marijuana and cigarettes, and many have co-occurring cocaine or opiate addictions. In contrast to the Young Adult subtype, about a third of these alcoholics seek help for their drinking problems. Functional Alcoholic – constituting 19.5% percent of US alcoholics, this subtype is well-educated, middle-aged, and with a stable job and family. A third have a multi-generational family history of alcoholism, and a quarter has had episodes of depression sometime during their lives. Half of this subtype smoke cigarettes. Intermediate Familial Alcoholic – constituting 19% percent of US alcoholics, this subtype is middl-aged, and over half come from families with a multi-generational history of alcoholism. Most of this subtype smoke cigarettes, and 20% had problems with cocaine and marijuana. Only one in four of this group seeks or receives any kind of help to treat their alcoholism. Chronic Severe Alcoholic – constituting 9% percent of US alcoholics, this subtype is typically composed of middle-aged adults who had early onset drinking problems. High percentages of them suffer from Antisocial Personality Disorder or display criminal behavior, and almost 80% come from families with a history of multi-generational alcoholism. This subtype also has the highest rates of co-occurring psychiatric problems, commonly including depression, bipolar disorder, and anxiety, and has the highest percentage of smokers and users of marijuana, cocaine, and opiates. On the other hand, this type has the highest rate (66%) of seeking help for their drinking problems, so is the most prevalent type of alcoholic found in treatment. In the next section, we provide more detailed traits of each of the five types. These drinkers tend to be young, and often are associated with the college and young professional “party scene.” That is, they drink heavily in the company of friends on weekends, but rarely during the week. As a group, they have low rates of mental illness and low rates of family alcoholism. Interestingly, while this group drinks less often than other alcoholics, they tend to “binge drink” more often and consume more alcohol during those binges. For example, on “binge days” members of this group often consume up to 14 drinks. Although the average age of this group is 24, most have spent at least the last four years as an alcoholic. Fewer than 9% of the members of this group seek help; when they do, they tend to prefer 12 Step programs over rehab clinics or private professional practices. This group is primarily in their mid-20s, and have the earliest age of onset of drinking (16). They tend to come from families with alcohol addiction problems, started drinking early, and also abuse other substances. NIAAA researchers found a definite link in this group to antisocial personality disorder (ASPD), which is not surprising because another study in the Archives of General Psychiatry found that one particular serotonin receptor in the nervous system is associated with both antisocial behavior and alcoholism. This is of interest because people in this group may be using alcohol as a form of rebellion, drinking heavily because it is not socially acceptable. Given the high incidence of mental illnesses in this group, they may also drink to “self-medicate” to help control these disorders. The traits of antisocial personality disorder include regular fighting and assaults, criminal activity, impulsiveness, deceitfulness, a lack of remorse, and an inability to accept responsibility for one’s own actions. 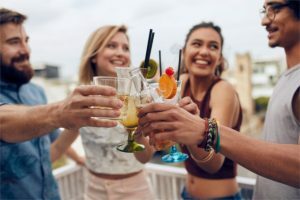 This may contribute to the group’s binge drinking behavior, the highest of the five groups, with people consuming up to 17 drinks at a sitting. Studies have shown that people with ASPD are 21 times more likely than normal to develop an alcohol dependency in their lifetimes. Over three-quarters of this group are male, and less than 8% received a college degree. About half are employed full-time, and their median family income is the lowest of the 5 subtypes. About a third of the members of this group seek help; when they do, they prefer self-help groups and detox programs. INTERESTING FACT: Young Adult and Young Antisocial Alcoholics presently account for about half of the alcoholism in the United States. People in this group disrupt many of the assumptions that people have about alcoholics, because they are older (average age 41), well-educated, often have stable jobs and families, and appear as if their lives are under control. They tend to drink every other day, as opposed every day. However, members of this group often have difficulties controlling how much they drink, so family members are often the first to notice and detect this type of alcoholic, as they watch the people they love retreat further and further from them to spend more time drinking. About 25% of the members of this group seek help; when they do, they prefer 12 Step programs and private treatment programs. The name chosen for this group seems odd, but was selected because the majority of its members are middle-aged and come from families with a history of alcoholism. The latter statistic is not surprising, because according to the Collaborative Study on the Genetics of Alcoholism, the child of an alcoholic parent is four to nine times more likely to become an alcoholic than a child without an alcoholic parent. It is unclear, however, whether this statistic is true because they watched alcoholic behavior growing up, or whether they have a genetic disposition to inherit the disorder. Members of this group began drinking at an average age of 17, and developed a dependence on alcohol at age 32. Of the five NIAAA alcoholic subtypes, this group has the highest employment rate, with 68% working in full-time jobs. About a third of the members of this group seek help; when they do, they prefer private treatment programs, detox programs, and self-help groups. Although this is the smallest group (9%), it is one of the most detrimental. This is because people in this group often have mental health issues that are difficult to resolve or deal with, such as anxiety, depression, bipolar disorder, and antisocial personality disorder, and also have addictions to other substances. They have the highest percentages of drinking more than they intended, alcohol-related work problems, withdrawal symptoms, and alcohol-related emergency room visits. While these facts may paint a less than hopeful portrait of this group, the NIAAA researchers also found that they are the most likely of any of their five subtypes to seek treatment. When they do, they prefer specialty rehab, detox programs, self-help groups, and inpatient treatment. Shared Traits – does an alcoholic personality type exist? 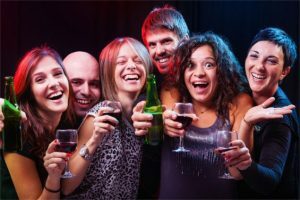 The 5 types of alcoholics postulated by the NIAAA have proven useful among professionals when trying to determine how best to inspire members of the different groups to seek treatment. But it’s good to remember that these types are just a theory and that every individual alcoholic is to some extent unique. That said, there are a number of traits that are shared between the groups, and that has led some researchers to further speculate about whether there is such a thing as an alcoholic personality type. The personality traits in the following list have been suggested as a basis for such a type, if one exists. When reading it, however, please remember that most people will recognize in themselves some of the traits below. This doesn’t mean that they are an alcoholic or likely to become one. Real alcoholics will display more of these traits, and more strongly. Low self-esteem – the alcoholic personality feels that they are “lesser” than other people, and of less value. Self-pity – alcoholics often feel as if no one understands them and that no one else is suffering; the “poor me” syndrome. Fear and anxiety – alcoholics often suffer from chronic worrying. They have fears of failure, fears about sexual performance, fears about being in social situations, etc. Perfectionism – strangely enough, the alcoholic’s fear of failure is often based on an unrealistic belief that they have to be the best at everything they do. 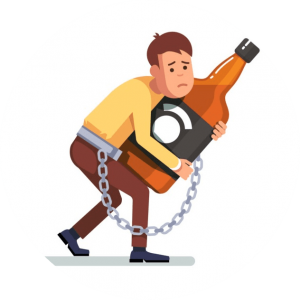 Impulsive – many alcoholics feel that when they want something, they want it right now, regardless of the possible consequences. Blaming others – as a group, alcoholics tend to blame others for their problems rather than themselves. Easily frustrated – alcoholics often become frustrated very quickly when things don’t go their way, and erupt into anger. They can also often have a low tolerance for negative feelings or situations that last for more than a few seconds. Feelings of guilt and shame – alcoholics often feel guilty, and admit constant feelings of shame, because they believe something is wrong with them. Dependence – the alcoholic personality type tends to count on other people looking after them and taking care of them. Professional alcohol counselors tend to call this trait codependency. 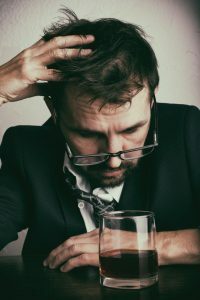 Addiction Resource » Alcoholism: Everything You Need to Know About the Addiction » Resources for Alcoholism: Getting Help to Beat Addiction » Different Types of Alcoholics: How Many Are There?